We recently held our 2nd Annual “Outside the box” Child Educational Conference, and it was, in one word, amazing! While that descriptive may be a little over used, it simply is the best way to describe another incredible day of sharing, learning, enlightenment and inspiration. It was another picture perfect SoCal morning as speakers and attendees began arriving at the event, graciously hosted by and held at Westmark School in Encino, California. After checking in, approximately 100 guests enjoyed a satisfying continental breakfast of fresh baked goods, fruit and plenty of tea and coffee. 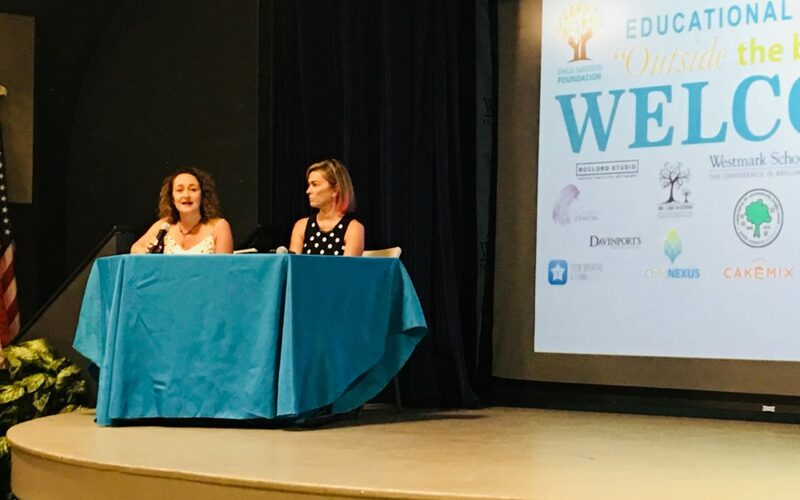 The event began with Claudia Koochek, Head of School at Westmark, thanking guests and introducing conference visionaries, Melissa Idelson (Child Success Center) and Jayme Neiman-Kimel, who shared some brief insights into the event topic, “outside the box kids”, and what would be discussed in the event’s sessions. 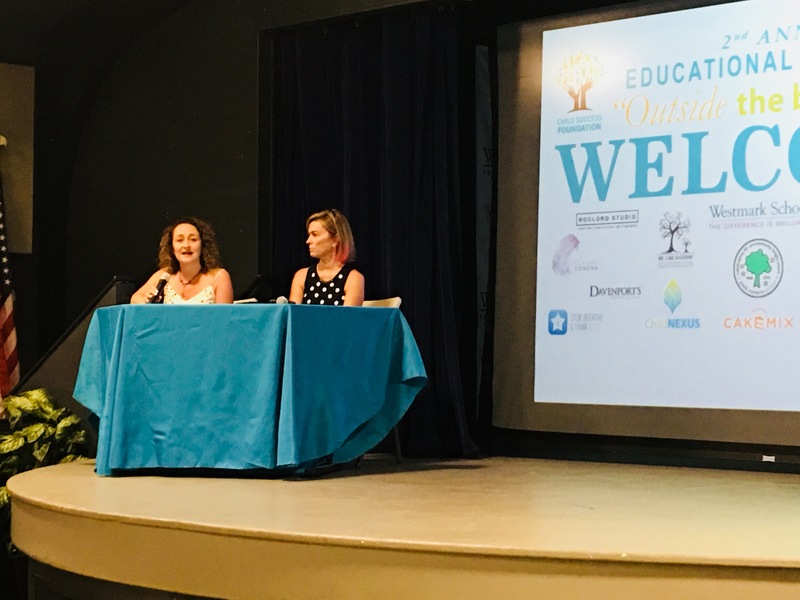 First up were Joan Surfas, OTD, OTR/L, SWC, and Merry Lee, OTD, OTR/L, SWC, with their presentation on Sensory Processing Disorder, which covered ways to recognize and support affected children, at home and in the classroom. The second session of the morning was a presentation by Dr. Thomas Brown, providing a unique perspective of ADD/ADHD and how parents, teachers and professionals can better understand the disorder and its relation to executive function – the management system of the brain. After a busy morning of note taking and “aha moments”, it was time to stretch our legs and replenish our energy with delicious lunch catered by Cafe Vida, Pacific Palisades. Guests took this opportunity to network and make new friends while nibbling on a delectable selection of fruit and vegetable salads, sandwich wraps, lemonade and cupcakes. After lunch, attendees were treated to a surprise – an inspiring performance from the Miracle Project, an inclusive theater company, which included an original song, “Iceberg”, about the desire to be seen as who we are inside. To say it was moving, is an understatement – not a dry eye in the audience. All we had to offer in return was a standing ovation. While that was a tough act to follow, Dr. Lawrence Simons, OD, delivered an eye opening presentation on Visual Processing Disorder, including an exercise engaging the audience, helping them understand what it feels like when your visual system is not functioning optimally. Our second half of the day also gave our attendees the opportunity to participate in a 20 minute guided mindfulness meditation that took them on an underwater journey. This could only have been brought to us by the brilliant minds behind “Stop, Think & Breathe”, an award winning personalized emotional wellness platform that helps kids, teens and young adults build the emotional strength and confidence to handle what life sends their way. Each guest then received the second surprise of the day – a one year subscription to the app! Feeling relaxed and invigorated, we listened to the last presentation of the day, also interactive, from Kelly Priest, Director of Social Learning at Westside Neighborhood School. She provided attendees with a “bag of tricks” that will help them teach their children, students and clients how to make good social choices. And because who doesn’t love winning something special, 6 raffle prizes were awarded, including a family photo session at Roclord Studio, swim lessons at Got Bubbles, cake decorating session at Duff’s Cake Mix, and gift cards for PLAY (music), Davenport’s Restaurant and Hamptons 818! Because of the generous support or our attendees, speakers and sponsors, Child Success Foundation was able to raise over $21,000 that will go a long way toward helping provide life changing therapies for children, as well as valuable outreach and education for families. We can’t wait for year 3! Click here to view Facebook Photo Album from event.